Sweet Beatle Dreams by Mary Mack Conger is an older Beatles book, published in 1989. Since then many other books similar to Mary's have been published that were better than this one. This book is Mary's diaries from 1964 & 1965 reproduced in book form. Mary was a 14 year old girl in Iowa in 1964 and she quickly became a Beatlemaniac after hearing their records. She writes about the Beatles in her diary every day and she talks about how her and her best friend, Sue did everything Beatles together: the would buy magazines, have sleep over, bake cakes on the Beatles' birthdays. Most importantly, they had tickets to see the Beatles in concert in Chicago in September of 1964! 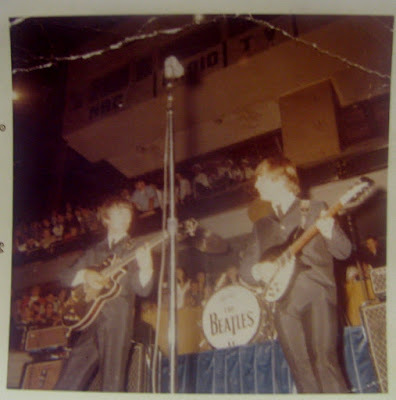 That summer they anticipated seeing the Beatles in person and when the big day came, it was as wonderful and amazing as Mary and Sue could have dreamed. I found the last part of the book to be sort of sad. Mary's mother did not approve of Mary being a Beatlemaniac and said that the Beatles were corrupting her and made her take down all of the Beatles posters in her bedroom. As the girls started high school and turned 15, Mary and Sue no longer were best friends. Like so many friendships at that age, they drifted apart. And by mid-1965, Mary realized that she had outgrown celebrating the Beatles' birthdays and basically was no longer a fan. I know it was the truth and it very well could be the story of any girl in 1964, but I was hoping that she would stay dedicated to Boys. This was a nice little book. Nothing amazing in it or anything. It was fast to read. I read it while my boyfriend and his son were watching a movie. By the time the movie had ended, I was done with the entire book. So this makes for a real nice and easy summer read, although Confessions of a Beatlemaniac by Dee Elis is a much better book in a similar style.